Hydraulic cart for transporting and storing the Revolution Pool Lift. A hydraulic ram powered transport cart with capture bars, this cart is designed for the safe removal and transport of the Revolution Lift. 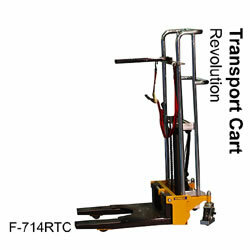 The cart is easily operable by one individual, and securely holds the Revolution Lift in place. Constructed of powder-coated stainless steel, the cart includes 6” locking casters and safety strap.